In this review, I will be taking a look at both the 8x and 10x25 Swarovski CL Pocket binoculars. A stylish looking, proper pocket sized binocular retailing at around £600 - did they meet my high expectations after many hours of use? I must admit to never having been a fan of compact binoculars - the pocket size advantageous, yes, but at too much of a compromise on image quality and in some cases, ease of use. The thing is, most people have compacts as a back up pair to their full size binocular, mostly taking them out when the weight of their 8x42 is just too much, or leaving them in the car. Don't get me wrong, this isn't a bad thing, as as pair of compacts is better than nothing at all. 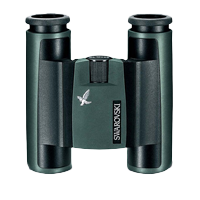 In my opinion, these Swarovski CL Pockets are something else - they are a pair of full size binos in a pocket binocular. A strange analogy, I know, but I've spent plenty of time comparing these to similarly priced 8x42s and find them every bit as good. With their Swarobright, Swarotop & Swarodur coatings, these CL Pockets gather as much light as a 25mm binocular possibly can, producing a vibrant, bright, high contrast picture. Looking up in to the rafters in a barn where a pair of Swallows were investigating a potential nest site, I could discern no difference in light between these and my control 8x42s. Only when daylight faded did I feel the larger objective lenses provided me with a slightly brighter image. The 8x25s have the edge over their 10x counterparts here, with a superior exit pupil (3.125mm compared to 2.5mm) meaning better light gathering. Still, none-the-less both binoculars rate very highly for overall brightness. With a 6.8° and 5.6° field of view on the 8x and 10x respectively, these pocket binoculars offer quite a wide image for a 25mm objective lens, better than most in fact. The most impressive thing is how they make use of it, with close to no drop off in sharpness at the edge of the picture. These CL Pockets don't have Swarovision field flattening lenses like their Swarovski EL relatives, but still produce a crisp image right up to the periphery of the view. They also don't feature HD glass like the ELs either, so you'd expect some level of Chromatic Aberration (purple fringing) in certain conditions. Testing on a rather overcast day, a pair of Wood Pigeons and a Collared Dove sat atop a telegraph wire provided the perfect opportunity to test for CA. I noticed a low level with the 10x25s, particular at the edge of the picture, but even less so with the 8x25s, a very small amount on the wire and birds when really looking for it. Close focus is quoted by Swarovski at 2.5m for both the 8x and 10x models - in my tests I found I could focus to just under 2m with both. 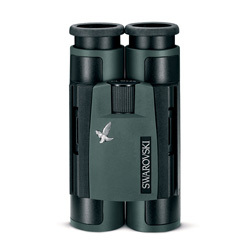 As with all Swarovski binoculars, the CL Pockets are made in Austria, where the attention to detail is second to none, and as you would expect, the build quality is exemplary. 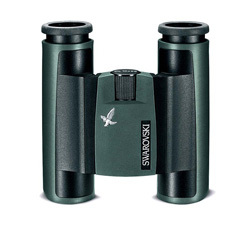 As well as simply being nice to look at, the combined green rubber armouring and metal chassis provide the binocular with adequate protection from every day knocks and bumps. At around 350g, they are very lightweight, perfect when you've got a lot of other gear to carry and are looking to keep your travelling light. The dual hinge also means they fold up incredibly small too, which itself has two advantages. One, obviously, is space saving - these CL Pockets really are 'pocket' binoculars. Two, not so obviously, is their minimum IPD (inter-pupillary distance) is very small, meaning they are comfortable to use for children and adults with close set eyes. Each hinge is perfectly balanced between being easy to adjust but firm enough to remain in position in use. The twist up eyecups (I don't wear glasses) gave me a very comfortable view, making full use of the FOV. Feedback I have received from spectacle wearers is very good on this front too. Of course, the CL Pockets are gas filled and fully sealed, making them waterproof (tested up to a depth of 4m) and preventing any dust entering the binocular or condensation building up on the inside. One of my biggest gripes with many dual hinge pocket binoculars is the small focus wheel - more often than not I find them too fiddly to adjust as they sit recessed in to the bridge. The Swarovski CL Pocket binoculars are once again an exception, with the focus wheel incredibly smooth to turn while remaining non-obtrusive. With just under 2 turns from close focus to infinity, fine adjustments are easy to make. The dioptre for focussing each eye individually is placed on the under side at the other end of the bridge. This leaves it well out of the way, preventing accidental adjustments, but still simple enough to set for your eyes. Packed in the box you will find a high quality soft case with the Swarovski 'Hawk' emblem on the front, and a belt loop on the back with a velcro attachment. The case also has a strap attached to it, giving you the option to carry the binos around in the case all day to keep them protected. The lanyard that is supplied for the binoculars is a simple nylon one, but then on a binocular that weighs under 400g you barely need the comfort of a padded alternative. Also provided in the box is a micro-fibre cleaning cloth, again of a high standard, but no rainguard or lens caps. Of course, keeping the binos in the carry pouch will keep the exterior lens elements protected from scratches, but I still feel it's a bit of a shame any sort of caps have been omitted. A 10 year warranty offers peace of mind, and of course being a Swarovski warranty, from personal experience I know it is a cut above the rest should you ever require it. I'll say it again - it's like a full sized binocular in a compact body. The performance of the CL Pockets is far superior to any other 25mm binocular I have used, and on par if not better than many comparably priced full sized bins. Its optical ability packed in to a compact, lightweight yet robust body has far exceeded my high expectations, as I'm sure it will for anyone that uses it. The lack of HD glass or field-flattening lenses do very little to reduce its performance and the addition of either (or both) would increase its price exponentially. I personally feel the quality/price ratio has been met perfectly, offering the enthusiast birder an exceptional glass, ideal for endless uses, that will fit in to any pocket. The 8x magnification will offer you a better all-rounder, but as always I would advise you look through both (if possible) before buying.